Across the country, millions of enterprising people are running businesses out of their homes. This report outlines the myriad benefits of home based businesses and suggests that government regulations curtailing them are short sighted. It details how home based businesses make entrepreneurship possible for people of all different backgrounds and socio-economic circumstances, all while making meaningful contributions to the economy and society at large. Across the country, millions of enterprising people are running businesses out of their homes. Lij Shaw and Pat Raynor are two such business owners in Nashville, Tennessee. Lij runs a successful recording studio out of his detached garage where artists have recorded and mixed countless hours of music, including a Grammy winning album. Pat, a 66-year-old widow who has been a hairdresser for over 40 years, converted her garage into a state licensed hair salon to support herself after her husband passed away. Neither Lij’s nor Pat’s businesses were causing a nuisance, but no matter. Both still fell afoul of Nashville’s out of touch zoning regulations which prohibit home based businesses from receiving any clients in the home. These regulations are more restrictive than those of most other cities, including ones that require government permission to serve clients in the home. Lij has had to stop advertising the location of his studio and has consequently taken a hit to his income in a bid to avoid having “Music City” shut it down entirely. Pat has had to move her business to a rented commercial space which she must work full time to afford. But as Pat gets older, she will need to cut her hours making her current arrangement unsustainable. Lij and Pat are not alone. Home based business owners in many cities face needless and arbitrary regulatory hurdles, like those in Nashville. They make their lives more difficult and force them underground or shut them down completely. This report outlines the myriad benefits of home based businesses and suggests such regulatory hurdles are short sighted. It details how home based businesses make entrepreneurship possible for people of all different backgrounds and socio-economic circumstances, all while making meaningful contributions to the economy and society at large. There are many reasons people might aspire to start a business. Perhaps, they want to be the next Steve Jobs or Mary Kay Ash. Perhaps, they are tired of the 9 to 5 and want to be their own boss. Or perhaps they want to fill a need in their community and make a living doing it. Whether their dreams are modest or ambitious, starting a business out of the home can make it more cost effective for would be entrepreneurs to achieve them. That is because the home can serve as a laboratory for trial and error, allowing a business owner to figure out what works and what does not work before taking on the expense of commercial space. Indeed, home based businesses generally require very little startup capital. One study found that the majority of home based businesses needed less than $25,000 to get going—a sum many owners are able to pull together from personal savings or loans from family and friends. Opening a brick and mortar business, on the other hand, can cost tens of thousands of dollars more, depending on the industry and location of the business. In Nashville, for example, rents for office and retail space are at an all-time high—around $23 per square foot for office space and $25 per square foot for retail space—making it difficult for small and independent businesses to thrive. That’s on top of all manner of other costs necessary to open a business, including acquiring all of the necessary permits, insuring the business and hiring employees. By reducing the need for substantial sums of startup capital, home based businesses put self-employment, business creation and entrepreneurship within reach of just about anyone. Particularly, in lean economic times, the low cost of starting a home based business can significantly reduce the risks inherent to starting a business. Not only can starting a business out of the home be a relatively low cost, low risk way of testing the entrepreneurial waters before getting in too deep, some home based small businesses just make sense, particularly, those operated by only one person. An overwhelming 60 percent of home based businesses are run by people who work by themselves. For an individual who just wants to personally offer tutoring, tax preparation or music lessons, it will likely never make sense or be financially viable to obtain commercial space. Home based businesses also provide flexibility and a wider range of options to people looking to support themselves and their families. Trading a traditional corporate career for a home based business can improve a person’s work life balance and make it easier for working parents to support their families while caring for children. This can be a particular boon for parents like Lij. A single father, he values the flexibility his home studio gives him to care for his young daughter. Home based businesses also offer flexibility to retired or semi-retired people who wish to supplement their incomes. Pat, for instance, moved her salon into her home’s garage to save money and support herself after her husband passed away. She enjoys being her own boss and does not want to employ anyone else or take on more clients.Working out of her home was ideal for her. Finally, home based businesses can also give those who are unable to work outside of the home due to disability or other health related reasons a way to support themselves. Home based businesses also offer an attractive path to entrepreneurship for women, veterans and minorities. When women and veterans own their own businesses, they are more likely to run those businesses out of their homes: In 2012, 58 percent of female owned businesses and 57 percent of veteran owned businesses were based in the home. Home based businesses are also common among minority business owners, with nearly half—46 percent—operating out of the home. One study found that female home based business operators’ primary motivation for going into business was to be their own boss. Their primary reasons for choosing to operate from the home were the lower operational costs and the ability to “balance work and family.” This makes sense given that the average age of the women in the study was 47—an age when many women are likely to have children still at home. Another study found that home based businesses in the rural Midwest are predominantly female owned sole proprietorships. When rural communities are hit by hard economic times, home based businesses become a particularly important way to supplement household incomes. Home based businesses are everywhere. For example, we analyzed Nashville’s business records and found at least 1,600 home based businesses operating in the city. It is likely that many more do their best to operate under the radar for fear of running afoul of Nashville’s hostile zoning regulations. These businesses provide valuable services to Nashville residents. Like Lij’s recording studio and Pat’s hair salon, over half of Nashville’s home based businesses are categorized as being in the service industry, including in-home day cares, photographers and house cleaning businesses. Home based businesses are also widespread and varied nationally. About 14 million businesses—52 percent of all businesses in the United States—are operated primarily out of someone’s home. And these businesses operate across a wide array of sectors, from lawyers and realtors to construction companies and day cares. 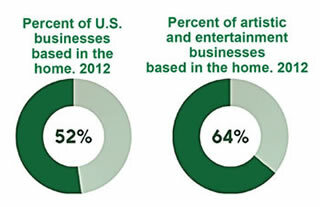 Nearly 64 percent of the nation’s artistic and entertainment businesses—just like Lij’s—operated out of the home in 2012. Most home based businesses generate modest revenues in keeping with their small size, but they still make important contributions to the economies in which they operate. Nationwide, they generated around $632 billion in 2012. It is a small portion (about 4 percent) of nationwide business revenues that year but still a considerable sum. Beyond their revenues, home based businesses likely have a meaningful impact on local economies. Particularly, in rural communities which are often those hardest hit by economic downturns, home based businesses provide economic security for displaced workers. Put differently, not only do the people who run home based businesses and their families benefit from the added income, but those people turn that income around by purchasing goods and services in their communities both for their businesses and their households. By so doing, they support local businesses and contribute to state and local tax bases. Home based businesses may also benefit the local and national economies by introducing new and unique products and services to the market. For example, many artisans use their homes to produce their products serving niche markets that might otherwise go unserved. Online platforms such as Etsy enable home based craftspeople to identify gaps in the market and sell their niche products to a wider audience. The home therefore plays an important role in the “new artisan economy,” which is continuing to grow as more and more consumers seek out unique or custom products to suit their needs. Even where home based businesses are not providing particularly new or unique goods or services, consumers still benefit. When willing customers are able to purchase the things that they want, everyone benefits. Using one’s home to earn a living is a common practice and one as old as America itself. It makes economic sense. Home based businesses provide entrepreneurs with more options, contribute to economies both local and national, and increase consumer choice. Indeed, a number of wildly successful businesses, including Amazon and the Ford Motor Company, have started in people’s homes and garages. And for every one of those, many other home based businesses have enabled people to survive a layoff, to earn a living while staying home with their children, to supplement retirement income, or to enjoy the simple satisfaction of being their own boss. Instead of getting in their way, cities like Nashville should welcome such entrepreneurs with open arms.